A lot of people are opting for a dairy free or vegan lifestyle these days, so as someone who enjoys following a dairy free diet I decided to put together my top tips. I'll start off by saying the good news is you won't have to wave goodbye to all your favourite treats by eliminating dairy from your diet, there is nearly always a substitute you can use to make a recipe work. Chocolate cake and pizza can still be enjoyed, it just takes a bit of experimentation. Kitchen gadgets like bread makers, blenders and sorbet machines can also come in very handy when you are trying out new recipes so dust them off and get ready to have some fun in the kitchen. Once you have made your decision to go dairy free I recommend getting a few key ingredients in to help you on your way. Firstly choose a non dairy milk option of which there are many these days. Soya milk is probably the most common one and you'll be pleased to hear that it is readily available in your local Starbucks or Costa if you fancy a latte, but there are plenty of other varieties that are worth trying such as oat milk which is great in cereals, rice or coconut milk and some you can buy or even make yourself like almond and cashew milk. 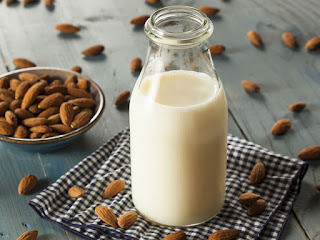 To make almond or cashew milk soak the nuts overnight for up to two days, drain and rinse them before popping them in a blender with some filtered water and whizzing up at high speed for about 2 minutes then strain and press, sweeten to taste and refrigerate. It is worth noting that almonds are high in calcium so great if you are worried about missing out on key nutrients as a result of eliminating dairy. Next on the list is a dairy free spread. I usually opt for Pure Sunflower or Vitalite Dairy Free Spread, both of which are found in supermarkets everywhere these days. These can be used in baking, cooking or just spread on your morning toast. Cooking oil is also an essential and I always have a bottle of olive and sunflower oil in my kitchen cupboard. I use olive oil for frying, sautéing, oven baking and roasting foods and when it comes baking I opt for sunflower oil as a substitute in recipes that include butter. Here's a handy conversion guide I follow when it comes to substituting these two. Biscuits, cakes, cupcakes, pastry and more all turn out really well when oil is used as a substitute so don't throw away your favourite recipes just because they have a dairy ingredient. Why don't you start by putting my recipes for Dairy Free Cupcakes or Chocolate Beetroot Brownies to the test and decide for yourself. Coconut cream and coconut milk is another one to have in as it is perfect for cooking sauces especially in Thai and Indian dishes and can even be used along with some other ingredients to replace sour cream (for 1 cup add 2 drops lemon juice & 1/16 tapioca starch), whipped cream (add orange zest & dash of honey) or yoghurt (1/2 coconut milk & 1/2 apple sauce). I was pleasantly surprised to discover just how well coconut cream that has been stored in the fridge whips up to make a fantastic substitute for cream. Don't be put off by the fact it is coconut even if you don't usually like the taste as it is in fact quite subtle and definitely doesn't overpower with it's favour. Unsweetened applesauce is a really good option for replacing butter, I have to admit I was surprised the first time I tried it but it has just the right consistency with a hint of sweetness which makes it perfect in muffins, cakes and breads such as banana bread or even in cake mixes. It also has the added bonus of being low in fat so it is a win all round. For all those chocolate lovers out there don't rule out going dairy free because you are reluctant to give up your favourite bar. Give dark chocolate a go, there are some delicious dark varieties out there well worth trying. 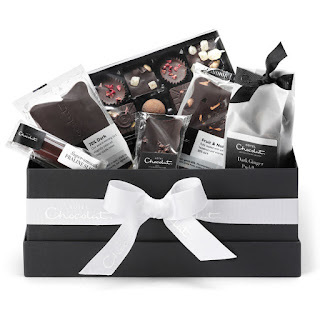 Hotel Chocolat do an amazing All Dark Vegan Chocolate Hamper which is a chocolate lovers dream with ginger, praline and fruit and nut delights included. I promise you won't be disappointed, you may even decide you prefer the dark side. I have also found that a few well chosen kitchen gadgets can give you a whole host of new options so you don't have to miss out. A sorbet maker or blender is one of my favourites as it means we can turn heathy fruit into delicious frozen deserts which the kids love. A blender can work here too but may take a bit longer. I try to make sure I always have a selection of frozen fruits ranging from berries to bananas in the freezer so we can whip up sorbet whenever we fancy a treat. The kids love experimenting with flavours and the possibilities are endless. Top tip if you want a creamier frozen dessert, add some coconut cream. You can also jazz it up with fruity syrups or a few drops of vanilla essence. I also love my bread maker as it lets us come up with fab new dairy free experimental breads, often adding nuts and fruits or just keeping it simple and making plain crusty bread. Our favourite is banana bread which is not only great for using up ripe bananas but quick and easy to make and always comes out smelling and tasting delicious. 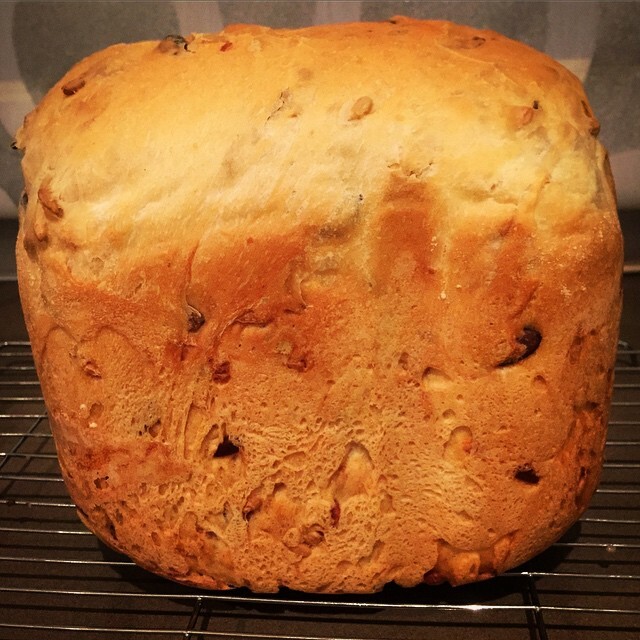 We love it so much I thought I would share the recipe with you. Place ingredients in the pan of the bread machine. Select the Dough setting, and press Start. Mix the bread for 3 to 5 minutes until the bananas are mashed and all ingredients are thoroughly combined. If necessary, use a rubber spatula to push the dough from the sides of the bread pan. When 3 to 5 minutes have passed on the clock display, press Stop. Do not continue mixing. Smooth out the top of the loaf with the rubber spatula. Select the Bake setting, and press Start. The Bake cycle time may vary with machines, but should be about 50 minutes. To test the bread for doneness, insert a cocktail stick into the centre top. Remove the cocktail stick. If the bread is done, the cocktail stick will come out clean. If there is dough on the cocktail stick, reset the machine on Bake and continue to bake an additional 10 to 15 minutes. Test again with the cocktail stick to assure the bread is completely baked. Remove the pan from the machine, but allow the bread to remain in the pan for 10 minutes. Remove the bread to cool completely on a wire rack. Word of warning, be careful when it comes to grabbing your usual pack of crisps as they often contain milk products in the flavourings. Similarly breaded or battered food like chicken nuggets, fish and even frozen chips may be made using whey or milk proteins so check the nutritional information if in doubt. Hopefully this post has been useful for those who are considering eliminating dairy from their diet or already doing so. My best advice is to just give it a go and experiment with substitutes and alternatives and you will find foods and recipes that work for you and your family and hopefully have a lot of fun while you do so.